Gujarat's history goes back to the Jurassic age. Also famous for the Indus Valley civilization, this state is unique in its geographical features as well. A vast sea coast, jungles with ferocious lions and always welcoming people, Gujarat, the land of Gujjars, is a truly vibrant state. Dwarka once supposed to be the capital of Lord Krishna, is in Gujarat. Gujarat celebrates approximately 2000 festivals in year out of which most are regional based fairs and festivals dedicated to the deity. Some of the famous are The Kite festival. It is an international kite festival held during the Makar Sankranti in January. People from the world come to participate in this internationally acclaimed festival for a display of their kites. The Dang Durbar coinciding with Holi in March is another big event in Gujarat. Held in the Ahwa region and Dang district it is a unique celebration of Holi by the tribes. Countless tribal people from the adjoining districts participate in the fair dressed in colourful traditional outfits dancing to the beats of drums. The prominence of Parsi community in Gujarat is much high than any other place in India. The Parsis came and settled in Gujarat first after they fled from Persia. The eternal flame burning in is the one they got from Persia along with them and is burning since the 8th century A.D. The Parsis celebrate their New Year Pateti, in August. They visit the fire temples and wear new clothes and generally make merry. The huge Janmashtami celebrations held in Dwarka, the abode of Krishna is a delightful sight. The most important festival celebrated by the Gujaratis is the Navaratri in October, before Dushera. Navaratri is an auspicious occasion that commemorates the worship of Divine Mother Goddess and her numerous manifestations. 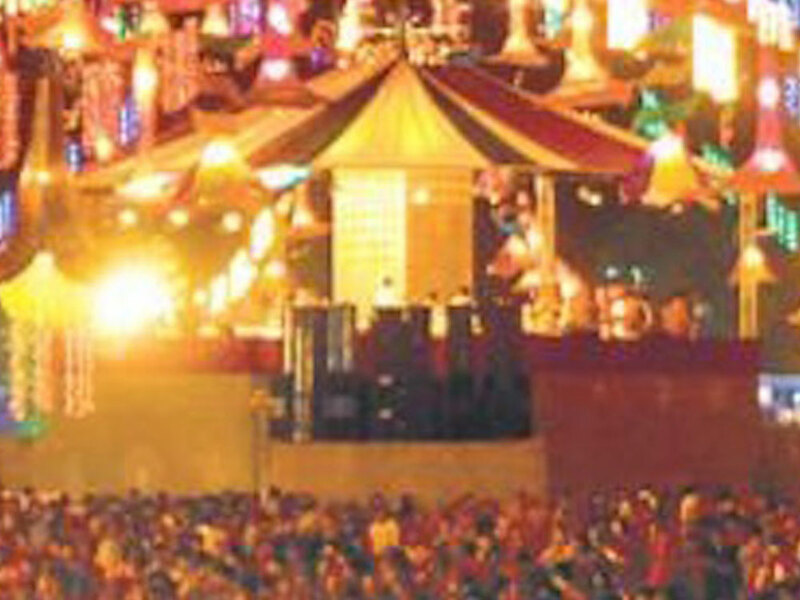 The nine-day cultural extravaganza wraps the entire Gujarat. During Navaratri, a pot with attractive designs is ceremoniously placed a light is placed inside. Religious texts are read out and people fast and later cook Gujarati delicacies to eat. The main feature of the Navaratri of Gujarat is its typical dance called the Garba raas. Mostly all the Gujarati ladies can dance the Garba, a rhythmic dance, danced in a circle with clapping hands and traditional songs to accompany with. The rhythm which is initially slow grows faster and the dancers match their footsteps along with that fast rhythm. Another Dance form performed during Navaratri in every nook and corner of Gujarat is the Dandiya. The concept is the same, only here men too can participate and the dancers use small sticks to give a rhythm. Every street in Gujarat is decorated and people come in their fineries to participate in the dance. The mood, the attire and the music are so upbeat and vibrant that every year, the festival attracts tourists from India and abroad.